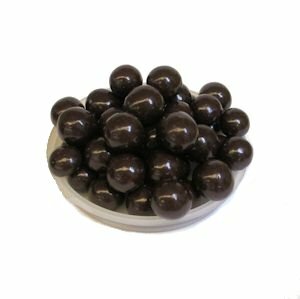 Amaretto cordials have a liquid amaretto-flavored center surrounded with rich dark chocolate. Dark Chocolate [Sugar, Cocoa Mass, Cocoa Butter, Soy Lecithin (an emulsifier), Vanilla], Cane Sugar, Natural Cocoa Powder, Confectioner's Glaze, Wheat Starch, Corn Starch, Gum Arabic, Natural and Artificial Flavors. May contain Wheat, Milk, Peanuts, Tree Nuts, Soybeans and/or Eggs.